MJ, how did you like Paw Patrol: Pups and the Pirate Treasure? What was your favourite episode (there are 6 in total on the DVD)? I love the story about the pirate treasure. They find a bit of a treasure map and they have to find the rest to look for the pirate treasure. It was great. I also like the Halloween story with the ghost ship. And the one about the circus. Marshall. He’s really clumsy all the time. He makes me laugh. But G (MJ’s brother) likes Ryder best (Ryder’s a little boy and team leader of the Paw Patrol). Is there anything you didn’t like about the DVD? Yes, let’s put it on again now. I think it’s safe to say this is going to be first choice DVD for our car journeys over the Easter holidays. The boys are completely absorbed by it and have spent all week singing the theme tune and acting out storylines from the various different episodes. It makes a nice change from Peppa Pig and Bob the Builder (although, as with these other pre-school favourites, the theme tune is annoyingly catchy and I did find myself humming it in the supermarket). 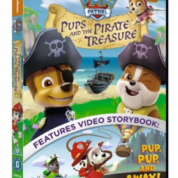 The Paw Patrol: Pups and the Pirate Treasure DVD (Nickelodeon) is released on Monday 14 March 2016. It features six new episodes and a special feature video storybook. Running time 89 minutes. Cert U.